After ten years of rebuilding, renovation and restoration, the Rijksmuseum will open its doors on 13 April 2013. Never before has a national museum undergone such a complete transformation of both its building and the presentation of its collection. Spanish architecture firm Cruz y Ortiz Arquitectos has spectacularly transformed the 19th-century building into a museum for the 21st century, with a bright and spacious entrance, a new Asian Pavilion and beautifully restored galleries. 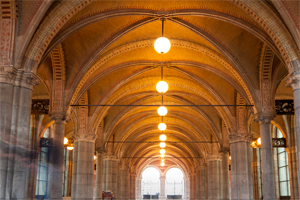 Under the guidance of restoration architect Van Hoogevest, the lavish decoration scheme of Pierre Cuypers, the original architect of the museum, has been fully reconstructed in a number of the museum’s key spaces. Parisian architect Jean-Michel Wilmotte designed the new interior of the galleries, fusing 19th-century grandeur with modern design. The presentation of the Rijksmuseum’s world-famous collection is also new. For the very first time, visitors can follow a chronological journey through the collection, and experience the sense of beauty and time this offers. In a sequence of 80 galleries, 8,000 objects tell the story of 800 years of Dutch art and history. 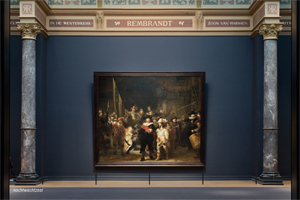 Only Rembrandt’s masterpiece The Night Watch will be returning to its original position.